There are so many fun Valentines Day Ideas! 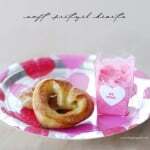 These Soft Pretzel Hearts are a super easy after school snack idea that we made at our Valentine’s Day party! On Saturday, I had a Valentine’s Day party at my house for some of my nieces and nephews. Well, it was mostly girls but a few of the boys joined us and they didn’t seem to mind all the pink. The party was all about baking for Valentine’s Day. I will share more about the party and some of the other things we made later this week. Since that post will end up being a little long, I wanted to share this recipe for Soft Pretzel Hearts in a separate post. This was the recipe that my sisters and sisters-in-law were most impressed with because it is so easy to make and tastes so good! They said that they are perfect for an easy after school snack. Start with a package of Pillsbury Original Breadsticks. 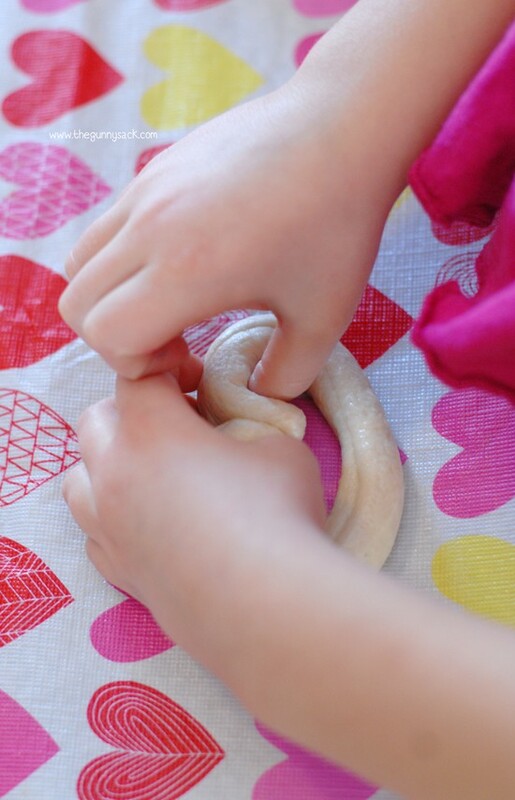 Separate the dough along the perforations and roll each breadstick, like the girl is in the picture above, until it is longer and thinner. If you can’t find Pillsbury Original Breadsticks, try using a Pillsbury Crust French Loaf like I did when I made Snowball Pretzel Nuggets. Or if you are living in another country where they don’t sell Pillsbury dough products (I feel very sorry for you and yes, I told Pillsbury that they should start selling their dough worldwide when I was at the Pillsbury test kitchens! ), you can make your own pretzel dough like I did when I made Homemade Soft Pretzel Nuggets. 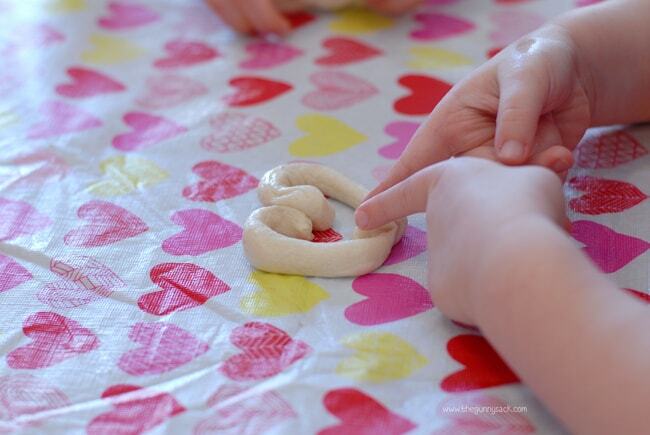 Form the dough into a heart shape, pinching the ends together so that they stay in place. Form the bottom of the heart into a “V”. If the breadstick breaks apart, like it is bound to do when little hands are working with it, just pinch it back together. 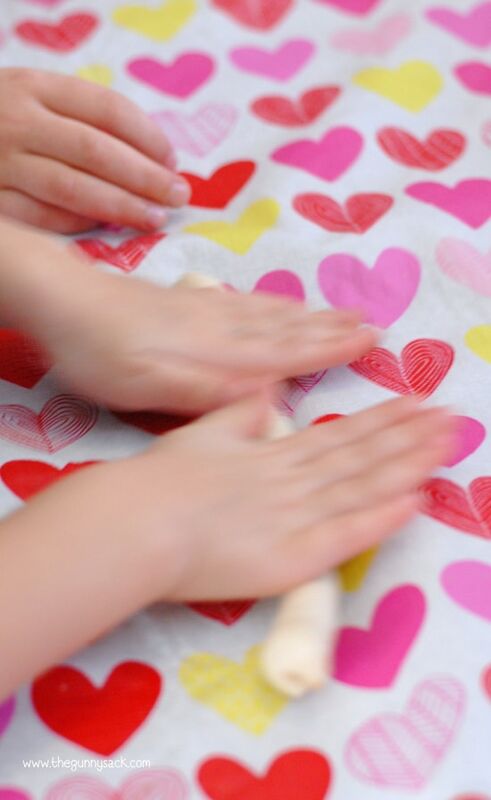 Dip the dough hearts into a mixture of 1 cup warm water and 2 tablespoons baking soda. Place on a silicon baking mat or greased baking sheet. Bake at 425 degrees for 7-9 minutes. Dip in melted butter and sprinkle with sea salt or pretzel salt. Here is a sneak peak of the other fun things we made at the party. I will share more of the fun Valentines Day ideas later this week. 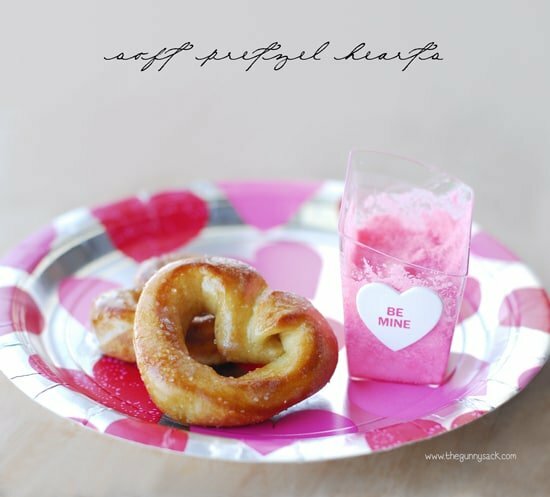 The pink frosting in the little cups is meant to be used as a dip for the Soft Pretzel Hearts. Separate the dough along the perforations and roll each breadstick until it is longer and thinner. Mix together warm water and baking soda. Dip the dough hearts into the baking soda mixture. Place on a silicon baking mat or greased baking sheet. Bake at 425 degrees for 7-9 minutes. Dip in melted butter and sprinkle with coarse salt. Something other than sweets to fill us up on Valentines! Great idea! I love soft pretzels and they are so cute shaped into hearts!! Fabulous idea! Soft pretzels are my WEAKNESS!! These look so delicious!! Soft pretzals are one of my favorite things ever but I have always been too intimated to try to make them myself. You make it look so easy though so maybe I should get over my fear and just do it!! These are totally do-able! You’ve got to give them a try! Such a FUN idea, Tonia! 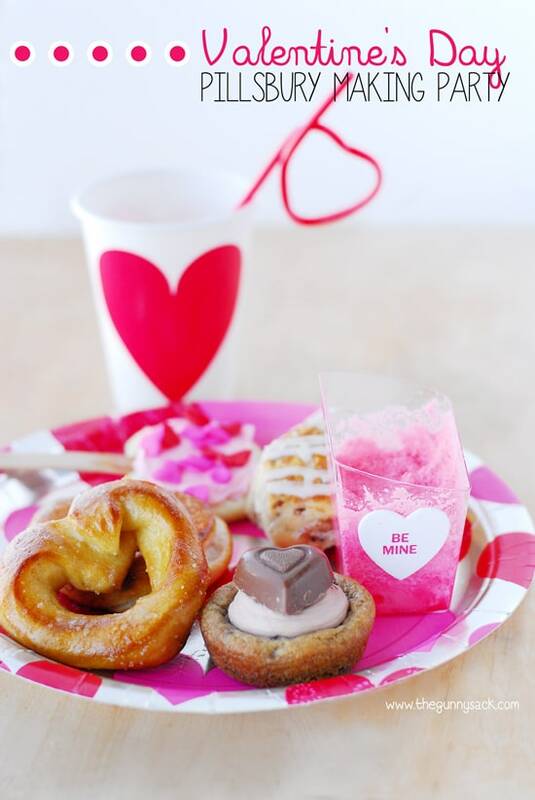 We’re having a Valentine’s Day party Saturday and I know my girls would LOVE to make these! These are so fun for Valentine’s day plus SO EASY! Love it! Wonderful! He’s going to love them! Thanks Lisa! Absolutely drooling over these pretzel hearts, Tonia! I am a pretzel fiend and could easily eat homemade pretzels daily.. if not meally 🙂 haha and here I am inventing my own words, too! 🙂 love that it’s made with Pillsbury Breadsticks! Such a time-saver! You are welcome to make up words on my site anytime! I agree with you, we love soft pretzels too, and let’s face it, who has time to make homemade pretzel dough on a regular basis? These pretzels are so cute, Tonia! And the party sounds like a blast! Those are just so cute! Love pretzels! Thanks Jocelyn! So do we! My kids always ask for them when we go to the mall. I love love love this!!! Awesome job, as always! Your talent blows me away!! Kate…you are so sweet! What a great comment to start my day! Thank you! Hehehe… I’m glad you thought of us living abroad! I think I’ll try out your recipe of homemade Pretzel Nuggets.